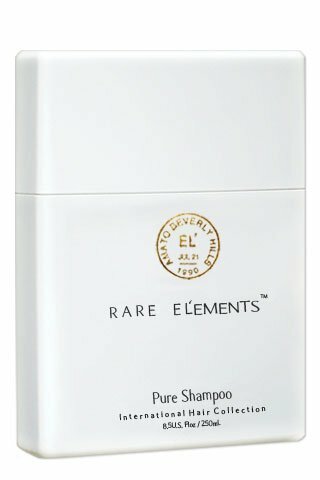 RARE EL'EMENTS Pure Shampoo - 8.5 fl. oz. Home / Haircare / Pure Shampoo - 8.5 fl. oz. Not only the amazing results but also the intoxicating scent make this shampoo our instant favorite! The opulent rich lather gently bathes and hydrates the hair with rare nourishing ingredients sourced from Japan and Italy. This journey starts with a sulfate-free shampoo that maintains a high level of performance. The opulent rich lather gently bathes and hydrates the hair with rare nourishing ingredients sourced from Japan and Italy. You will also explore the wealth of the moisture balancing benefits from the healing herb,Black Seed, along with the exotic African watermelon seed oil, Kalahari, which naturally dissolves sebum build-up. With each use the hair is properly cleansed and nourished without over- drying or stripping. Pure Shampoo provides perfect harmony and balance to each strand of hair while enhancing its condition and restoring shine back to its original state. Ideal for color treated as well as undernourished, moisture-deprived locks. Aqua Purified (water), Sodium Cocoyl Isethionate (coconut), Lauryl Hydroxysultaine, (Coconut), Sodium Sheamphoacetate (Shea Oil), Citrullus Vulgaris (Kalahari Melon) Seed Oil, Nigella Sative (Black Seed) Seed Oil, Sclerocarya Birrea (Marula) Oil, Rosa Canina (Rosehip) Fruit Oil, Brassicamidopropyl Dimethylamine (Brassicacae Oil), Melanin, Wasaba Japonica (Wasabi) Root Extract, Polyquaternium-10, Superoxide Dismutase, Guar Hydroxypropyltrimonium Chloride, Cananga Odorata (Ylang Ylang) Flower Oil, Pelargonium Graveolens (Geranium) Oil, Aniba Roseaeodora (Rosewood) Oil, Citric Acid, Glycol Stearate, Hydroxyethyl Behenamidopropryl Dimonium Chloride, Capryly Glycol, Phenoxyethanol, Octadecyl Di-t-butyl-4-hydroxyhydrocinnamate.